If creating a successful Amazon FBA business were a sport, it would be a 400 meter sprint. Long enough where it requires a dedicated exertion of effort, yet short enough where it indeed is a sprint. Speed matters. That is the genesis of Jungle Scout: to save time in doing the repetitive tasks and offer better data insights at the same time. 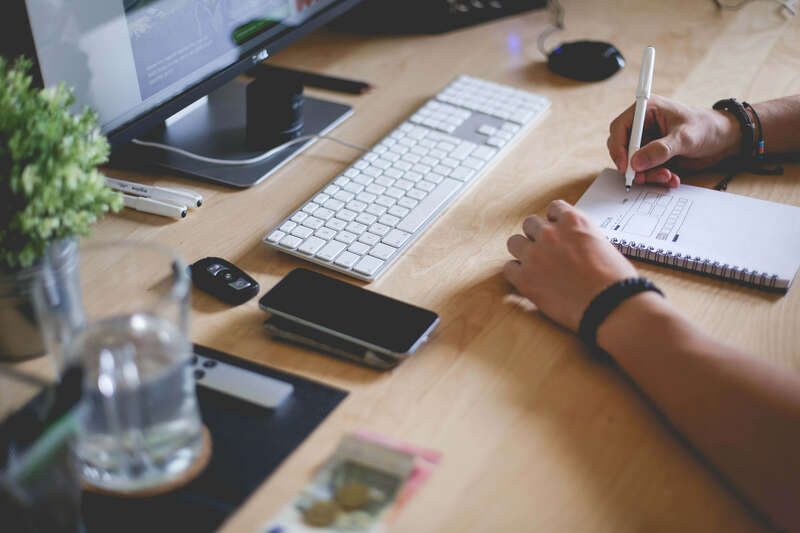 So we have some new product features that will help you move through your Amazon product research with greater productivity and decision-making ability. By using the Chrome Extension, we can quickly identify products that have low competition and high demand. Suppose there is an outlier in the results tab. Instead of including that in your CSV output, and including those figures in the overall Averages (at the top of the Jungle Scout screen), you can remove it altogether by simply clicking the numbers in the “#” column to the far left. Now what does this tell you? You can see historical price fluctuations for the selected product, and how the prices differ for both Amazon and the Marketplace. You will often see a lot of movement for a seasonal product, like this BBQ grill brush. Or it could be a promotion the merchant was running (presumably to drive sales and improve Best Seller Rating). Or maybe the merchant was running low on inventory and preemptively avoiding running out of inventory? These are all possibilities, and part of the competitive analysis that we will dig into in future blog posts. Looking at the trend line of the Best Seller Rank can reveal some interesting data points as well. Simply click a figure in the Rank column in order to pull up the historical data. Do you see any anomalies in the Jungle Scout results, like a top organic search result with a surprisingly low BSR? 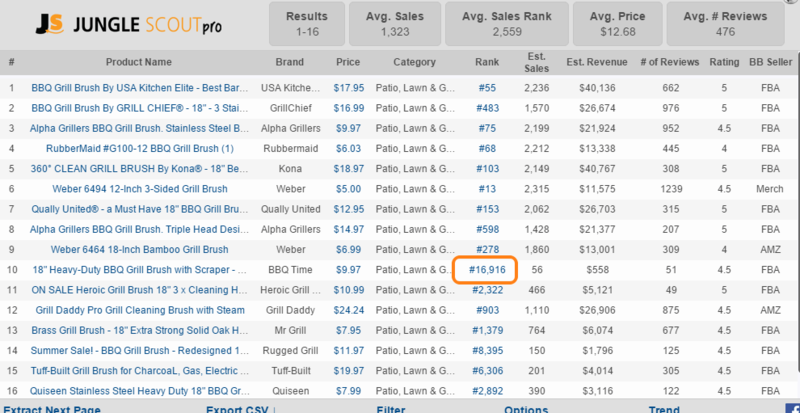 In this example of competitive BBQ Grill Brushes, the top ten results have excellent BSR’s, #598 is the highest in the Top 9. If you want a dog fight of an FBA battle, BBQ brushes may be it. The anomaly here is a relatively new entrant, BSR #16,916 and 51 reviews. Bravo to this seller for breaking into the Top 10 out of nowhere like Bieber in ’07. This is where you can use Jungle Scout to dig in to the historical BSR ranking, check the Pricing, and piece together the puzzle of a seemingly successful summer for this merchant. 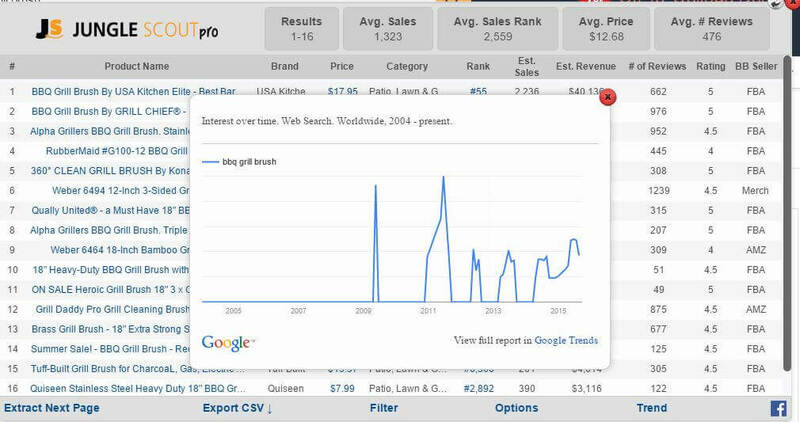 Before everyone jumps on Alibaba to purchase BBQ Brushes site-unseen, there’s one more metric you may want to look at. Simply click the “Trend” option on the bottom of the page, and you will automatically pull the Google Trends report for that given search term. No surprise, you are seeing the sharp peak/valley of a classic seasonal product. Now go out and gather, slice, dice, and eat up the data that Jungle Scout provides. And let us know what you think of these new features? Are there still issues you encounter in your product research that you think Jungle Scout could address? Let us know in the comments, we love to hear from you! Until then, Happy Scouting. 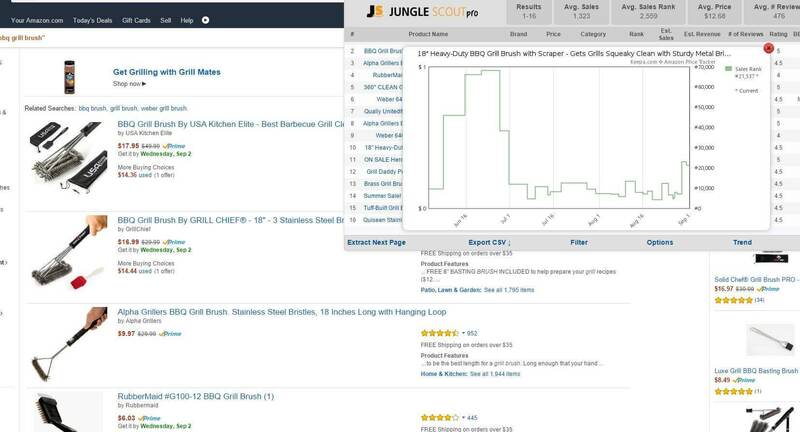 Does Jungle Scout Pro enable you to download historical sales data for each product line? Unfortunately, no, it doesn’t. It does take into account past sales when creating algorithms and also gives you Google trend analysis. If you want to see historical sales data, I recommend Keepa. It’s a free Chrome extension that goes directly into your Amazon page and can show you their historical data (they have about 3 years worth of sales data as of this writing). It’s a little more tedious to pull up each individual page versus doing an Amazon SERP check with JS Pro, but it acts as a nice complement, especially if you’re doing RA and OA. When using the extension you are searching all of the products on each page that you are viewing. When you do this on a category page, for example, extracting the next page will add the next page of results from Amazon into your extension window. This makes it easy to find more results without exiting the extension and moving on to the next page of results. If you only want data for a specific number of products, then you can easily export the data and slice and dice it any way you wish. i am not able to see trend button on my jscout extension? what to do? Do you have Jungle Scout Pro? You will need that in order to see the Google Trends, or you can just go to trends.google.com to see for the particular keyword. Thank you for letting me know. Was it support at junglescout.com that you emailed? you can email me at gen at junglescout.com, and I can help you as well. Talk to you soon! I’m trying to learn all the in’s and out’s on JS. Where can I find more training? Do you do live classes? You’ll find a bunch of great training videos. Also, if you subscribe to our mailing list we will let you know about some training webinars we have coming up soon! Thanks for the feedback, glad that you are enjoying the product! You will certainly be a Ninja in no time….if you have any particular questions, don’t hesitate to reach out and ask. Happy scouting!